Whether you want moonwalks, inflatable slides or bounce house rentals in NY, you will find this one-stop directory has it all! 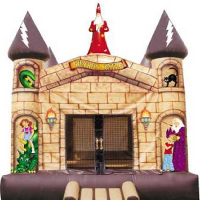 For parties big and small inflatable rentals NY make things more fun. Kids parties are a blast when you have bounce house rentals. KidsParties.party lists trusted and reputable companies that offer boucne houses, obstacle courses and other fun inflatable rentals in NY. Visit our website to view all our products, www.partyperfectrentals.com and start planning your next event today! Email info@partyperfectrentals.com for a custom quote. Serving New York, New Jersey and PA - We come to you! Providing Bounce Houses to all 5 Boroughs! Clowns.com has everything that you need for your child's next special event. Serving all New York, New Jersey, Long Island and Westchester County, we offer a large range of party rentals such as bounce house rentals. No matter the size party, this inflatable rental will make any kids party more fun. 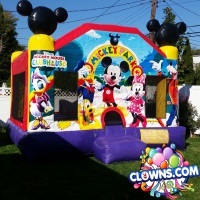 When you want to have a blast, look to Clowns.com for your next bounce house rental in New York. Your favorite child will love all of the characters, magicians, balloon artists and other things you choose for their special day. We have all of your party essentials in one place. Contact us today to begin the planning process. Instant online quotes on our website! 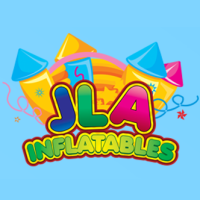 JLA Inflatables is fully registered and inspected by the state of New York and New Jersey. We are family owned and operated and supply hundreds of different kinds of bounce houses, combos, slides, obstacle courses and toddler units for any themed party. JLA Inflatables carries themed bounce houses including Mickey Mouse, Elmo, Batman and many more. For the summer months we also have several water slides, as well as dunk tanks, tents, fun food and carnival games. All of our rides are cleaned and sanitized before and after every rental! Our all day rentals are the same low price! Visit the website for more information and to get your instant quote today! #1 Kids Party Entertainment Company! 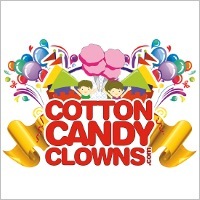 Cotton Candy Clowns is proud to be New York's favorite kids party entertainment company! Since opening in 1998, they have grown from a small party rental company into a full-service kids entertainment agency! Cotton Candy Clowns is equipped with every entertainment option you could need for your next event! They offer a variety of party entertainers and rentals including clowns, costume characters, bounce houses, dunk tanks and concession rentals. They offer packages to accommodate parties and events of all sizes, from backyard birthday parties to full-size corporate events, Cotton Candy Clowns has the staff and inventory to make your event a success! They offer 14 party packages to accommodate any budget; if you do not see an option that fits your needs, call to customize your own! Visit the website for a full breakdown of package options then call to book your next event. The one stop shop to make your party shine! Top Line Parties and Events is a party rental and entertainment company. 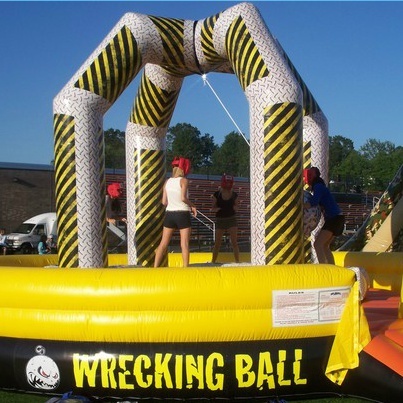 We supply party rentals such as inflatable bounce houses, games, obstacle courses, tent rentals, tables, chairs, mechanical bulls, bumper cars, and much more. We also have entertainers and concessions such as magicians, clowns, balloon twisters, face painters, cotton candy, pop corn, snow cones, pretzels, nachos, hot dog machines and almost anything else you could want or need at your next event. Call to book us for your next event, big or small. For more information check out our full page listing! Kids Entertainment is a proven party entertainment company servicing all of New York, New Jersey, Westchester County and Long Island. 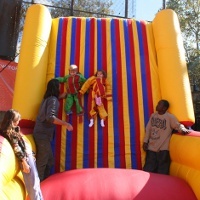 We offer a variety of party rentals including bounce house rentals in New York. 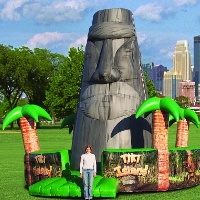 Ultimately no matter the size of your party, this inflatable rental will make any special event more memorable. Kids Entertainment has many packages including balloon artists, magicians, costume characters, princesses and more. Allow our party experts to help you plan your next party. Contact us today to plan your next special event at 516-900- 2678. Huge Selection of Bounce House Rentals NY! This fun inflatable rentals NY company is family owned and operated and has been providing fun bounce rentals for parties and events for over ten years. 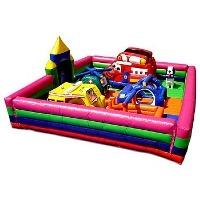 A huge selection of inflatable play places, slides, obstacle courses and bounce houses are available from Leaps N Bounces for your next kids event. 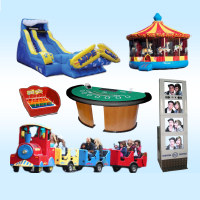 In addition to their huge selection of inflatables, this company offers the rental of carnival games, trackless trains, dunk tanks and carnival food machines. 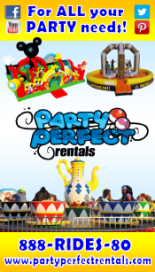 Make your party a hit when you rent from Leaps N Bounces! Bounce Arena can rent you all things inflatable, from obstacle courses and interactive games, to boxing rings and super slip and slides, you'll find it all at this fun company who offers inflatable rentals in NY. 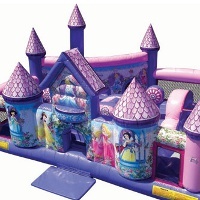 If you are throwing a kids party, choose one of Bounce Arena's themed bouncers such as the "Disney's Princess Bouncer" or the "Sponge Bob Square Pants Bouncer." If you need other kinds of decorations or supplies for your party, Bounce Arena also rents tents and canopies, trackless trains and carnival food machines such as popcorn and cotton candy. Inflatables, Carnival Food and More! 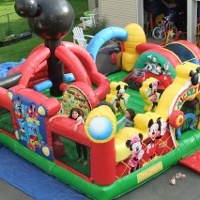 This inflatable rental company in New York strives for 100% customer satisfaction - they guarantee that when you rent a bounce house or inflatable from them it will be clean and ready for a day of fun use. 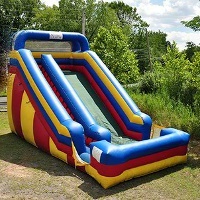 A large range of bouncers and slides are available from New York Inflatables including various wet slides, an obstacle course, a bungee run, and many sizes and types of bouncers. In addition to their fun inflatables, they can provide extra fun at your party with live entertainment by magicians, clowns and face painters, and various carnival food machines. Your event will be unforgettable when you rent from New York Inflatables. Slide, Crawl, Jump and Roll on these Inflatables! This great bounce house company can offer you a colossal range of inflatables. 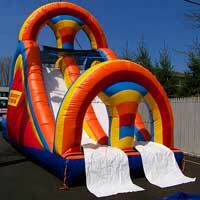 Bounce houses, inflatable towns, obstacle courses, slip and slides, inflatable chairs, bars, tents and games. Whatever you are looking for to make your party unique, you can find it at Frankie's Carnival Time. From Batman and Sponge Bob to Strawberry Shortcake and Winnie the Pooh, without a doubt, Frankie's Carnival Time has one of the largest selections of themed bouncers around! A great choice for a child's themed birthday party. Are you planning a kids party and want to make it extra fun? 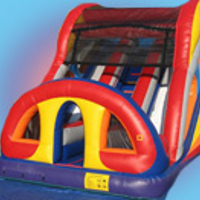 Rent an inflatable slide or bounce house from TGIF Rentals and give your kids a great time! With themed bounce houses such as Noah's Ark and Island Survivor Obstacle Course, the kids at your party will be busy for hours. If you're having party in the sun, consider getting a fun inflatable slip n' slide so the kids can cool off while having a blast! For extra outdoor party fun you can also rent dunk tanks, carnival games, clowns and entertainers for an unforgettable party. Bounce House Rentals in NY and More! These professional party people have what it takes to make a kids party loads of fun - inflatable bouncers, water slides, arts and crafts, carnival games and much more. When you plan your child's next birthday party or kids event be sure to add an inflatable gladiator joust, rock climbing wall or obstacle course! With over 40 fun inflatable options to choose from, they're sure to have something that will be just right for your party. In addition to inflatables A Total Jump also offers snow cone machines, cotton candy machines, popcorn machines and other carnival food machines that will be a huge hit at any kids party. Full Service Staten Island Party Entertainment Company! When you use Party Jam to make your next party special, it is sure to be an unforgettable event. They offer a huge range of inflatables in a variety of types, from moonbounces to obstacle courses you are sure to find something that is just right for your kids party. Check out their Adreneline obstacle course or the Cliff Hanger slide. For fun in the sun, water slides and slip n slides are also a great choice. In addition to the amazing selection of inflatables Party Jam can offer live entertainment such as clowns or magicians to really bring your party to life. Kids will never forget the party you threw using Party Jam's expert services. Small World also offers mini bouncers for toddlers - these pint sized inflatables are perfect for children from 1 to 4 years old and are a great choice for your next outdoor toddler party. If you need party entertainment ask about their clowns, magicians, DJs and other professional entertainers. Bungee Runs, Moonwalks, Bounce Houses and More! This inflatable rental company boasts an unmatched level of professionalism, reliability and customer service. When you need inflatables for your party, big or small, you can find them at Aardvark Amusements. Choose from moonwalks, inflatable slides, sport inflatables and obstacle courses. You can rent inflatables that will fit with your party theme, from general themes like carnival or princesses, to specific themes such as beloved Disney movies or superheroes - whatever your child fancies, Aardvark Amusements can help it come true. Offering a Full Range of Services for Kids Parties! If you are planning to throw a children's party in Manhattan you won't want to miss the chance to rent a bounce house or inflatable slide to entertain the kids. They'll keep busy for hours jumping, sliding, rolling and leaping in one of the many bouncy fun houses offered by NY Kids Time. From the Monster Wave Water Slide which is perfect for a summer party, to a small 11x11 bounce house perfect for a few children at a time - there's something for every size and type of party. To make your party complete, rent a few carnival games or mechanical rides from NY Kids Time and make it an unforgettable day! Huge inflatable slides, obstacle courses, splash slides with mini pools attached and fun bounce houses are just a few of the great inflatables offered by Celebration Entertainment. This great company which offers bounce house rental NY has everything you need to make your child's birthday party or kids event extra fun. 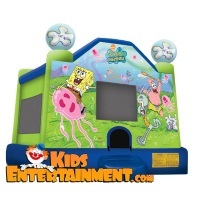 If you are throwing a toddler party, Celebration Entertainment also offers several toddler bounce units in different themes that are sure to please your little ones. Check out their combination bounce houses and slides! Costumed characters, DJs, and kids entertainers are also available from this party company. Whether you are looking for a small bouncy castle or a large slip and slide wet inflatable, Affordable Inflatables can accommodate your needs. This company offers fun inflatables for all party sizes, your party is sure to be a blast when you rent a bounce house for the children's entertainment. Kids of all ages love to bounce and jump for hours in these moonwalks and bounce houses. Affordable Inflatables also offers a wide range of non-inflatable rentals to make your party complete. Check out their carnival games, dunk tanks and casino equipment. For a unique party attraction rent their 24 foot high rock climbing wall!